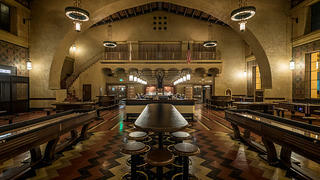 For decades, the former Fred Harvey restaurant at Los Angeles’ Union Station sat vacant, its soaring ceiling and Art Deco, Spanish Colonial Revival, and Southwestern design elements hidden from the public. When it opened in 1939, the restaurant—designed by architect Mary Elizabeth Jane Colter as part of the Fred Harvey chain of eateries found at many railroad stations starting in the 1870s—was a popular spot for hungry travelers and, in the 1940s, men returning home from war. But the restaurant closed in 1967. It remained largely empty, used only for the occasional film shoot or special event. 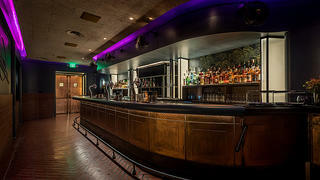 Finally in October 2018, following a major four-year renovation process, the space reopened its doors to the public as two new dining establishments: Imperial Western Beer Co., a restaurant and bar with its own attached brewery, and The Streamliner, a smaller craft cocktail bar. Both put their historic details on full display. The Fred Harvey restaurant opened in 1937 and was designed by architect Mary Elizabeth Jane Colter. The recent work added enough seating for 435 people, custom game tables, and a bar made of brass, walnut, and fluted glass. 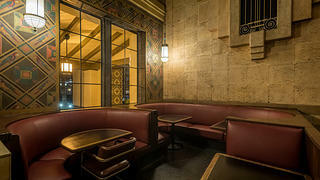 The restored space highlights the original Art Deco, Spanish Colonial, and Southwestern design features. Imperial Western Beer Co., named after the legendary Southern Pacific train of the 1930s, is a cavernous space featuring tiled walls, a floor designed to look like a Navajo rug, and windows that flood the space with natural light. 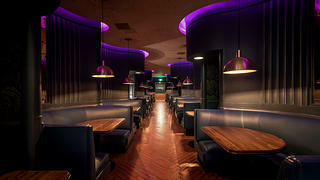 With seating for more than 400 patrons, the restaurant is now also equipped with light fixtures and custom-built furniture, including deep leather booths and a bar made of brass, walnut, and fluted glass, all inspired by 1940s train travel, along with tables for games like pool, shuffleboard, and checkers. On the menu, there's a selection of craft beer brewed in-house, plus items like oysters, fish tacos, fried chicken, burgers, and po’boys. The Streamliner, a smaller cocktail bar, retains its original Streamline Moderne features. The copper bar face and metal detailing throughout The Streamliner were left distressed to give the space a well-worn feeling. Adjacent to Imperial Western Beer Co. is The Streamliner, a much smaller, more intimate lounge in what was once a breezeway leading to the former Fred Harvey restaurant. Today it retains many of its Streamline Moderne details, like its curved walls, amber bubble glass, and the original wainscot panels that were uncovered in the restoration process. Cocktails are the main draw, but the menu also includes beer, wine, and plenty of bar snacks. 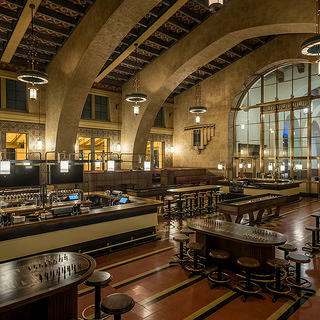 Both Imperial Western Beer Co. and The Streamliner are the vision of 213 Hospitality, a Los Angeles-based, preservation-minded hospitality group helmed by Cedd Moses. The team at 213 Hospitality partnered with design firm AvroKo, architect Janel Wright Design, and R.S. 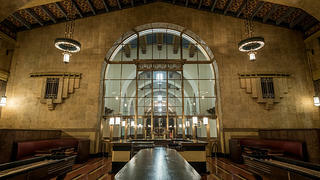 Herman Architects to bring the storied Union Station restaurant back to life. The Los Angeles Conservancy served as an advisor on the project.